Following Versions 1 and 2 of the HCR-20, the HCR-20V3 embodies and exemplifies the Structured Professional Judgment (SPJ) model of violence risk assessment. Its most common applications are within correctional, forensic and general or civil psychiatric settings, both institution and community-based. Individuals ages 18 and above. 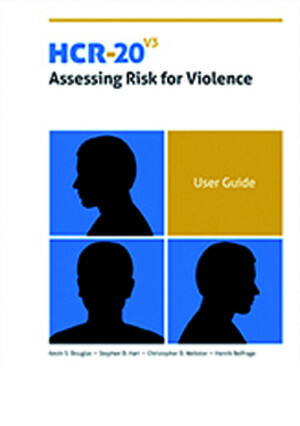 HCR-20V3 contains extensive guidelines for the evaluation of not only the presence of 20 key violence risk factors in a client, but also their relevance to that particular client. It also contains information to help evaluators construct meaningful formulations of violence risk, future risk scenarios, appropriate risk management plans, and informative communication of risk. HCR-20V3 builds upon a solid foundation laid by Versions 1 and 2 of the HCR-20. Version 2 of the HCR-20 has been subjected to more than 200 empirical evaluations based on more than 150 independent data sets. It has been translated into 20 languages, and has been adopted or evaluated in 35 countries. Recent research indicates that it is the most commonly used violence risk assessment instrument in the world. Subjected to exhaustive testing and evaluations, this revision is expected to be even more clinically useful than its predecessor while still enjoying a solid empirical basis. Subjected to exhaustive testing and evaluations, this revision is expected to be even more clinically useful than its predecessor while still enjoying a solid empirical basis. Research on the HCR-20 Version 3 using approximately 800 participants across three settings (forensic psychiatric, civil psychiatric, correctional) and eight countries is reviewed. Administration: Untimed. Scoring: 5 minutes.